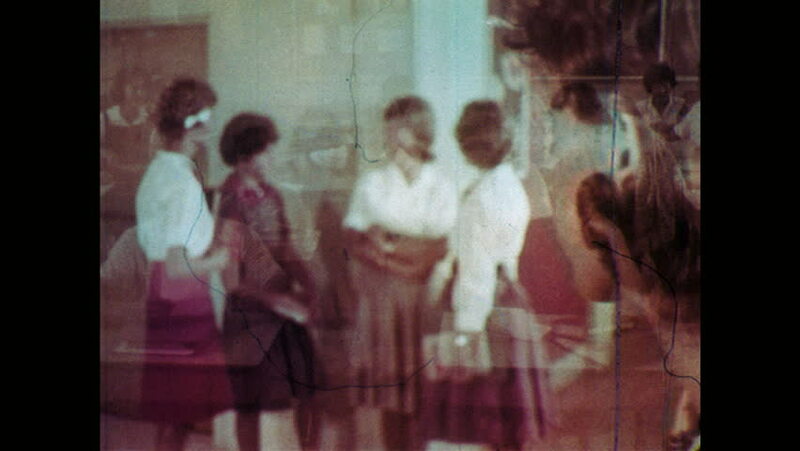 1960s: Group of girls stand in hallway, talk. Girl stands near group, looks anxious and sad. Group of girls sit around table, look at books, talk. hd00:23UNITED STATES 1970s: Close ups of job seekers in counseling. hd00:151970s: Teacher holds hands and runs in circle with kids. Children play on playground equipment. Teacher helps child go down slide. hd00:261970s: A horizontal cylindrical tank on a scaffoldlike mount is in flames. Firefighters stand closely together and train their hoses on both the tank and the scaffold support below it. hd00:151970s: Angry men shout at national guard troops. Guardsmen try to calm men down, point guns at men. hd00:16Hawaii 1930s: Young women and girls perform hula dance. Young woman plays a percussion instrument, while two others play ukulele and sing.